Tucked away at Metro Center in NW Washington, DC sits Celadon, a full service spa situated amongst the likes of law firms and lobbyists. The one-off location offers Washingtonians a variety of massage, waxing, body, hair and skin services, along side a retail boutique outfitted with the very same products used in their treatments. At 8am on a Monday morning Celadon was buzzing with activity, that I imagine weekends were non-stop with appointments booked well in advance. The morning started out with the Ultimate Luxury facial, but not before I was able to pick the brain of owner and licensed esthetician, Judith Koritsas, on what to change, add or remove from my winter skin routine. Shea butter: This thick fat, extracted from the nut of the African shea tree, is white or cream in color and is great for the body and face. Facial oils: It sounds counter-intuitive to put oil on your clean face, but Ms. Koritsas says it's great for all skin types, it's anti-bacterial and best to blend with your daily moisturizer. Water: Every building, subway and restaurant is heated in the winter time, which means our skin loses water. When you notice the skin on your face feeling pulled and dry, it's a lack of water in your body. Drink up! Use a product that contains Hibiscus: Helps heal stressed out skin; this flower extract softens the skin, because it works as a natural emollient, great to apply after a day of skiing or a post-run in the cold weather. Exfoliate: If you have dry skin or find that it's irritating to your face, exfoliate less often or switch to a gentle product, such as Eminence Strawberry Rhubarb Dermafoliant, which uses rice powder to soak up oil and strawberry to hydrate the skin. Use Sunscreen: Everyday, all four seasons, you must use sunscreen! Worried about the chemicals in the sunscreen? Have no fear. In it's boutique, Celadon sells chemical-free sunscreen so you can lather up sans nasty toxins. Last, but not least, Ms. Koritsas states "DO NOT push when using a Clarisonic -- it loosens dirt and dead skin when used gently, but creates stress to the skin (and won't remove the grime as effectively) when pressed into your cheeks and forehead." If you're in the Washington, DC area, I highly recommend making a trip to Celadon -- ask for the Ultimate Luxury facial with Susan. Your face will feel great from the treatment and your mind will be blissed out from the smells, sights and calming nature of each and every service provider and employee with whom you come in contact. 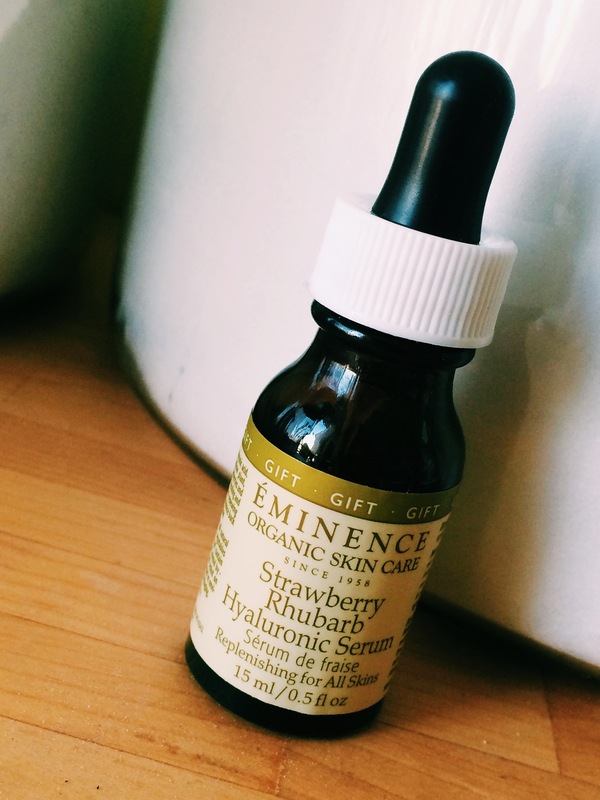 I was sent home with a few samples and I've found one that I will add, year round, to my skin care regimen -- the Eminence Strawberry Rhubarb Hyaluronic Serum. I had tried the product for a few days, but forgot to pack it in my carry-on when I went away for a business trip. That night, I washed and moisturized my face as usual, but noticed it lacked the suppleness and elasticity it had gotten used to the past week. The only difference was the lack of serum - I made note to NOT make that mistake again. Yes, it truly made that much of a difference in the feeling of my skin. Any winter time tips that you swear by? Leave them in the comments below. * Celadon gifted me the facial, but the thoughts and opinions here are my own. No pay for play here.